The Canadian Dressage Team took the silver medal at the CDIO 3* Nations Cup. Ottawa, ON, March 31, 2018 – The Canadian Dressage Team delivered under pressure to take the silver medal in the CDIO 3* Nations Cup, held March 28-30, 2018 during the 12th and final week of the Adequan Global Dressage Festival (AGDF) in Wellington, FL. Teammates, Diane Creech of Caistor Centre, ON, Brittany Fraser-Beaulieu of Saint Bruno, QC, Megan Lane of Loretto, ON and Jill Irving of Moncton, NB landed in their second place position from the get-go after the CDIO 3* Grand Prix, which represented day one of team competition on March 28. Fraser-Beaulieu led the team aboard All In (Tango x Damiro), the 13-year-old Dutch Warmblood gelding she co-owns with her father, Craig Fraser and husband, Marc-Andre Beaulieu. Starting strong for the maple leaf, she scored 69.804% for fourth place in the grand prix. They returned the following day to rack up another fourth place position and a new personal best score of 71.148% in the CDIO 3* Grand Prix Special. “All In is still a bit green in the Special, so I was extremely thrilled with his performance,” explained Fraser-Beaulieu, who has been on fire at the AGDF this season, setting new personal bests throughout the season, and picking up her first CDI 4* win during week 10. Lane nabbed fifth in both the Grand Prix (69.391%) and Grand Prix Special (69.234%) with her 2016 Rio Olympics partner, Caravella (Contango x Riverman), a 17-year-old Dutch Warmblood mare she co-owns with her mother, Cathy Lane and sister, Kelsey Lane. 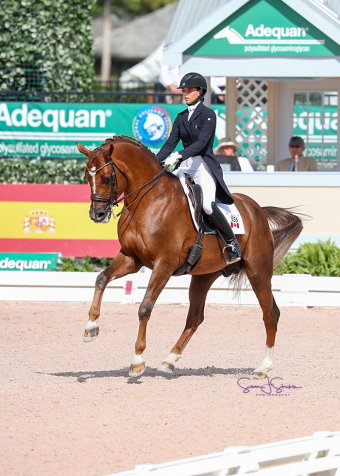 Irving took sixth in the grand prix with 69.043% and seventh in the special with 67.234% aboard Degas 12, the 16-year-old Hanoverian gelding she owns with Windhaven Farm. Creech rounded out the Canadian contingent with eighth place in both the grand prix and the special, partnered with Chrevis Christo (Chrevi’s Cavallo x Matador), a 15-year-old Danish Warmblood gelding she co-owns with Louise Leatherdale. After the application of the big tour bonus marks, the Canadian Dressage Team earned their silver medal on a total of 424.855 points, with the United States taking gold (452.327) and Australia picking up bronze (396.743). After the team portion of the competition wrapped up, the individual honours were decided in the CDIO 3* Grand Prix Freestyle on March 30. Fraser-Beaulieu and All In finished just off the podium in fourth place, but ended the AGDF season on a high note, breaking their personal best score yet again after earning 76.990%. Irving and Degas 12 closed out the week with a sixth place freestyle finish on 71.530%, while Creech took eighth place aboard Chrevis Christo after scoring 65.325%. Canada was also strongly represented by two teams of up-and-coming athletes in the CDIO-U25 Nations Cup, presented by Diamante Farms. The team placings were determined solely on the results of the CDIO-U25 Intermediate II, held March 28. Team Canada 1 landed on the podium in the bronze medal position after teammates, Naima Moreira Laliberté of Outremont, QC and Laurence Blais Tétreault of Montreal, QC went down centreline in impressive fashion. Spain took home the gold medal, and the United States earned silver. Moreira Laliberté led the team with a third place finish on a score of 67.882% aboard KML Sàrl’s 12-year-old Swedish Warmblood stallion, I Do Kiss (French Kiss x Donnerfly). Blais Tétreault added an eighth place finish on Mathilde Blais Tétreault’s 17-year-old Dutch Warmblood gelding, Utah (Jazz x Landwind II B). Team Canada 2, made up of Tanya Strasser-Shostak of Sainte-Adèle, QC and Vanessa Creech-Terauds of Caistor Centre, ON placed fourth overall. Strasser-Shostak contributed a fifth place finish with a score of 66.029% riding Renaissance Tyme (Royal Diamond x Dream of Heidelberg I), Evi Strasser’s 15-year-old Oldenburg gelding. Creech-Terauds placed ninth aboard Devon L (De Niro 6 x Wolkenstein II), an 18-year-old Hanoverian gelding owned by Diane Creech and Louise Leatherdale. Canada’s U25 athletes continued to hold their own over the following two days of individual competition in the CDIO-U25 Grand Prix and Grand Prix Freestyle, held March 29 and 30, respectively. Moreira Laliberté and I Do Kiss were once again the nation’s top placed pair, finishing fourth in the grand prix (66.880%) and fifth in the freestyle (68.167%). Blais Tétreault and Utah took seventh in both classes, closing out the season with a score of 66.375% in the freestyle. Strasser-Shostak added two eighth place finishes to her record with Renaissance Tyme. “I would like to thank the competition organizers and all the sponsors – without them and the support they put toward these shows, we couldn’t have these great experiences for the development of our athletes,” concluded Peters. For more information on AGDF 12 and the Nations Cup, and full results, visit http://gdf.coth.com . Thumbnail Photo: Naima Moreira Laliberté was Canada’s highest placed individual in the CDIO-U25 Nations Cup aboard I Do Kiss.